When you order a pizza, you want it delivered as fast as possible! The last thing you want is slow, inefficient service. That’s why Pizza Parma is here. We’ve been offering the best pizza delivery service to Upper St. Clair residents for over 15 years! We believe that quality food must always be paired with quality service. At Pizza Parma, we’re well-known for our excellent customer service and stellar catering options. At the end of the day, though, our delicious menu has cemented our place in pizza delivery to Upper St. Clair. Our food is truly the talk of the town! We work with only the highest-quality local ingredients: yummy Italian cheeses, highgrade meats, and the best in locally grown vegetables. We pride ourselves on producing delicious, high-quality food for the community. 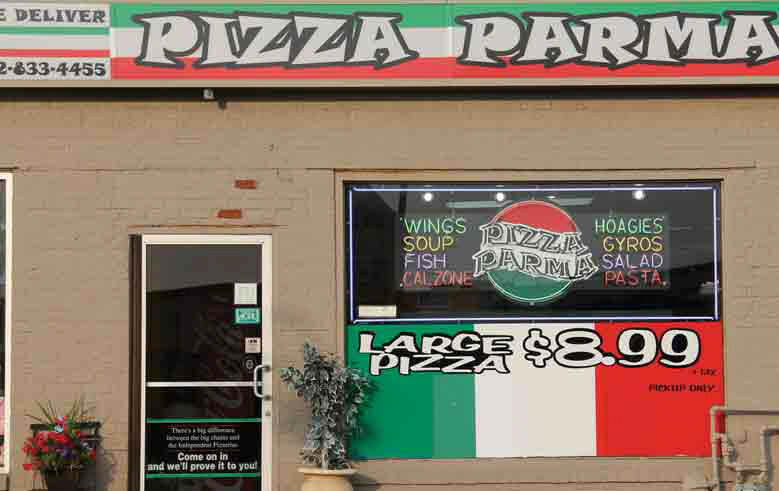 If you’re looking for a top-notch pizza delivery service in Upper St. Clair Pittsburgh, Pizza Parma is here for you. Get in touch with us when the next family reunion comes around — we offer catering for all sizes of gatherings and parties. Our selection of hoagies, subs, wings, and pizzas will satisfy everyone at your get-together. Don’t hesitate to contact us today to hear more about our catering options, speciality packages and menu items, and delivery services. We’re always happy to speak with you! A charming township located in Allegheny County, Upper. St Clair is roughly ten miles from downtown Pittsburgh. Upper St. Clair boasts deeply-entrenched historical roots — the town was founded by European settler John Fife in 1762. In 2009, U.S. News & World Report voted Upper St Clair one of the best U.S. cities to live in. Several notable people hail from Upper. St Clair, including the novelist Stephen Chbosky and various NFL players. The town is also home to a selection of fine restaurants and well-regarded arts galleries. Pizza Parma is proud to offer quality pizza delivery to Upper St. Clair.